This bold, beautiful interior by Ben Pentreath is the standout scheme at London Design Week 2019. One only has to observe accolades all over social media to understand the far-reaching impact that this room is destined to have for the year, or even the years, to come. The much admired English designer and architect has created this setting for GP &J Baker’s smart new showroom entrance at the Design Centre, Chelsea Harbour. 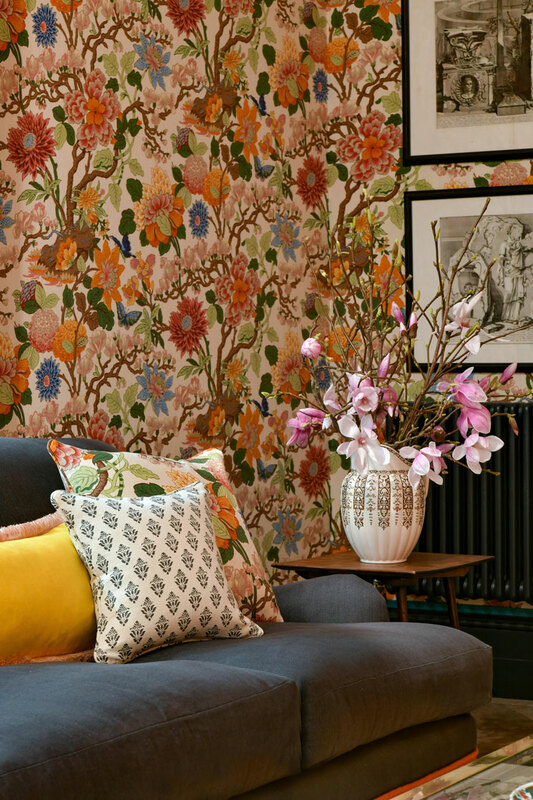 It features layer upon layer of exuberant pattern in a way that pushes current boundaries of design and encourages bravery with colour, yet, built around GP & J Baker’s archival Magnolia fabric design which was first drawn by William Turner more than 100 years ago, it also characterises the historic interiors awareness that underscores all of Ben Pentreath’s work. It aptly demonstrates the colourful past of English interior design as well as the value of a reconsidering prints from the archives to inspire a joyful take on interiors for today.